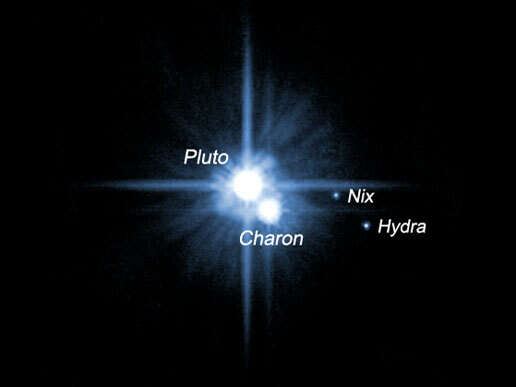 Nix and Hydra, that are the Pluto’s small moons was discovered by astronomers using NASA’s Hubble Space Telescope,in 2005.The two moons are nearly 5,000 times fainter than Pluto and are about two to three times farther from Pluto than its large moon, Charon.Nix is dimmer and smaller than Hydra. Astronomers think that both moons are smaller than 50 miles (80 km) in diameter.According to observations of Pluto’s moons by Hubble telescope astronomers believe that Nix and Hydra formed at the same time as Charon, early in the solar system’s formation, when a large object from the Kuiper Belt region collided with the dwarf planet. Pluto’s three moons are made of the same material, and because of that they reflect the same colors of light and also orbit in the same plane. Until now astronomers haven’t been able to find out the sizes, reflectivity, temperature and shapes of Nix and Hydra, and also the nature of their orbital resonance. They hope that can give the answers of these questions when the New Horizons probe gets up close with the mini-moons in 2015.